For my own work I don’t just want a map to be the outcome of a walk in a physical or imagined space, but also the method by which to create it. The situationists worked like this, creating maps to highlight “psychogeographical contours” or “articulations” of the modern city. They described the “constant currents, fixed points and vortexes that strongly discourage entry into or exit from certain zones. The situationists through the experience of the dérive, imagined an art which resembled architecture. Walking structures experience; we perceive ourselves and our environment in interaction as we walk along the path. We shape the space as we go. The idea Poy and I have for our collaboration project is to each create a tactile map based on a walk in two places – a walk from our house front door into our everyday supermarket. My walk I know very well but will be new to Poy, and vice versa for me walking in Poy’s neighbourhood. What difference in mapping will we see between the known place and the new place? This entry was posted in 04 Research and tagged Alternative Maps, collaboration, walking on 30 September,2015 by antalbot. My research paper is coming along nicely and I have at its core the work of walking artist Richard Long. I went on an expedition last Friday – a 6 hour return train trip and walk of 15.42km no less – to see the Time and Space exhibition currently showing at the Arnolfini in Bristol. It was a fascinating collection of Long’s work in a gallery which first showed him in 1972, and which gathered together a range of works which link to Long’s childhood home in Bristol and showed the connection he has with the place. I have seem some of Long’s physical gallery installations before, but never seen any of text works shown alongside them. You cannot help but stop and think when you see the words imprinted in large font across the white wall, almost haiku like in its contemplativeness. Standout pieces: Muddy Water Falls 2015, the latest in a series which Long applies mud directly to the gallery walls. This piece has been made with mud from the banks of the river Avon. The work is a record of a physical action of the dynamic gestures which are dictated by the nature of the materials being used – the splashing, fluid quality of the mud. This ‘mud wall’ is surrounded by a series of quiet textual records of landscape, many of them also referencing an experience Long had along the banks of the River Avon. I also very much associated with another text work in this room, the “Red Walk” from 1986. I found completely the opposite – as you look at the text, you know it is real. You know it describes an actual walk, a physical movement in the world that you cannot help but imagine as you follow the journey in words. I see them more as a poetic record which offers a different way to look at the world, seeking for something deeper than just the footsteps on the land. After the gallery, I wandered off on foot to find the outdoor piece commissioned by the Arnolfini for the show up on the Downs just north of the city. On the way I walked the long way round to take in the magnificent views of the Avon Gorge from the Brunel-built Clifton Suspension Bridge. Wow. You could see instantly how a young artistically minded Long could not have helped but be inspired by this place. The tidal range of the Avon is massive and I was lucky to hit it at low tide, when you could see vast edges of mud exposed alongside the river channel. Looking at this, you can see exactly what Long is embedding into his muddy wall work – physically and emotionally. After that revelation (which will be going into the essay!) the Boyhood line, was unfortunately almost a let down. The Line is a collection of stones in a line across the Downs where Long played as a young boy. The line itself was nice enough to see in person, but better was seeing how the land beneath has stared to react to the stones. The stones were laid along a desire line, “one of the many tracks which criss-cross the Downs, created by commuters, dog-walkers, runners, traders, farmers, and ancient Britons; those that remain visible, and those that have faded away”. And that sums up so nicely what it is I like most about Long’s work. This entry was posted in 04.1 Artists references, 04.2 Exhibitions and tagged Richard Long, walking on 17 August,2015 by antalbot. Sometimes serendipity smiles on you, and three weeks ago I was offered a last-minute spot on a full-a-year-in-advance course being led by one of my project’s main reference artists: Alice Fox. The activities began today! I wanted to go on this primarily to experience first hand the methodology of someone who can so successfully capture the essence of a place into her work, using walking as a key part of her practice. She also is a big user of natural mark-making and dyeing processes so should be able to teach me a few new tricks to add to the box. As an aside….I am aware my MA proposal is still in flux between three different angles on our sense of place: (1) psychogegraphy / making through walking, (2) culture v nature / wildness and (3) potentially bringing in elements of humanity’s cosmological sense of place. This week’s course is playing into the hands of the first two – but I’m not going to worry about aligning anything for now – I’m just learning and enjoying the process, and intend to make what feels right for the materials we use this week…. So! Today we started with an overview of Alice’s methodology and the principles behind the course. She talked though some of the context around walking and collecting – as a method for recording experience of place / landscape. This record can be through objects, images, words and thoughts which captures a snapshot of a particular place and time. Alice also had some very interesting thoughts on using found objects (directly or for mark-making), in that she seeks to explore the potential of materials have been found, to see how far they can be pushed. This is one of the things I’ve not succeeded fully with yet on my project…. We spent the rest of the day experimenting with two different processes. First up was rust printing on paper and fabric strips. Having done a lot of rust dyeing recently looking at texture, I thought I would do something different by focussing on the quality and pattern of the marks – hoping for some clear distinct lines. We just used tea as an activator and will need to wait a day or so to see how they turn out. Second up was eco-printing using a process of India Flint (I have her book! ), which I haven’t tried before. This involved gathering a whole host of different leaves and botanical oddities, wrapping and steaming in order to transfer the whole mark onto the substrate. Again an opportunity for clarity of mark as well as just transfer of colour. These also have to dry out fully before we can look at them – maybe tomorrow or the next day! So far, very enjoyable and Alice is a great teacher (plus we had cake). Getting some interesting whirring in my brain about my project – letting them swirl by themselves for now. 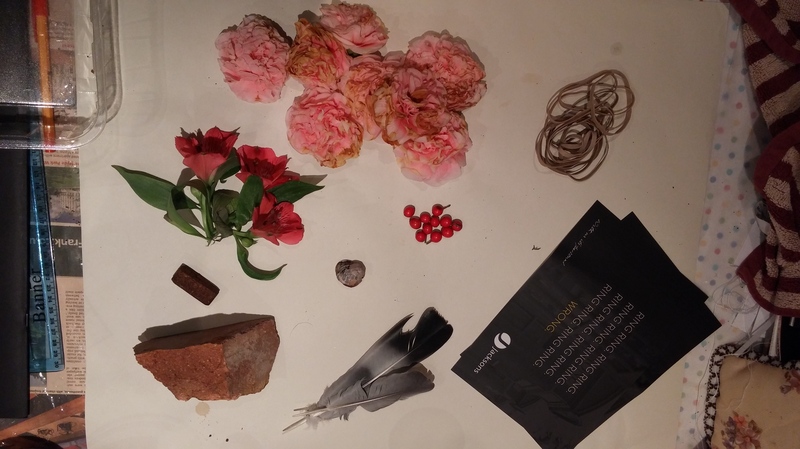 This entry was posted in 03.5 Unit 1 experiments, 04.3 Materials and process and tagged alice fox, natural dyeing, psychogeography, walking on 23 June,2015 by antalbot.